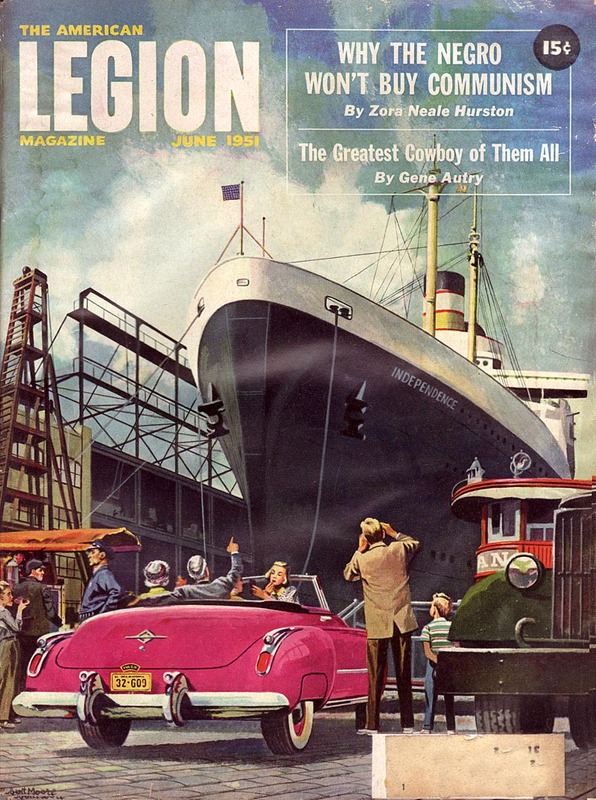 "I purchased a lot of old American Legion magazines, as one of them contained a John D MacDonald story I was looking for. I now own all twelve issues from 1951, plus a few more, and noticed several familiar names -- familiar to me now thanks to following Today's Inspiration. I thought I would send them along to you for your collection." ... but I also love their portrayal of American society of that era. 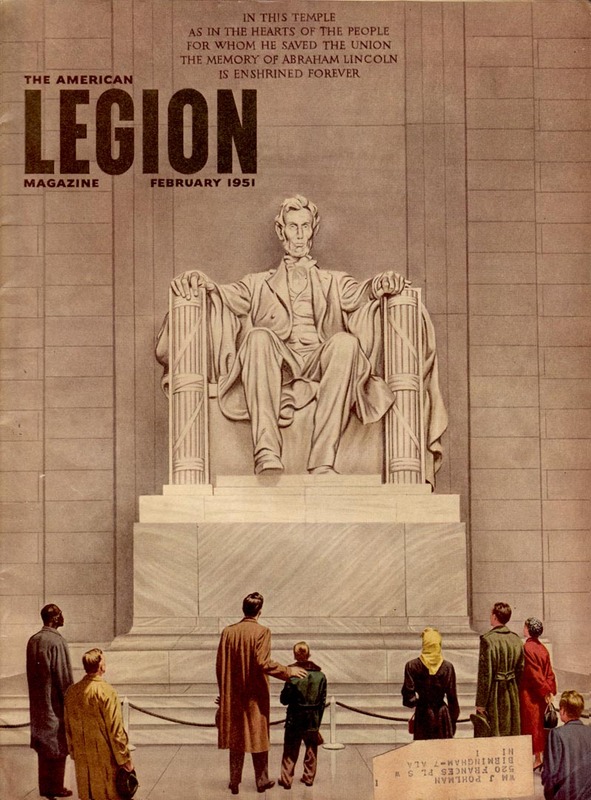 ... but sometimes there is a distinctly right-of-center editorial message that I suppose must have seemed perfectly appropriate to American Legion subscribers (and probably a significant portion of the broader American population). This was, after all, the beginning of the Cold War era. Communists were everywhere! Here's my favourite cover of the year. I love the tag line on that subhead: "Parents can rid campuses of communists who cloak themselves in "academic freedom." As Steve wrote in his note, "a typical left-wing college professor poisoning the minds of his students. I think the bow tie says it all." Yes. Yes it does. 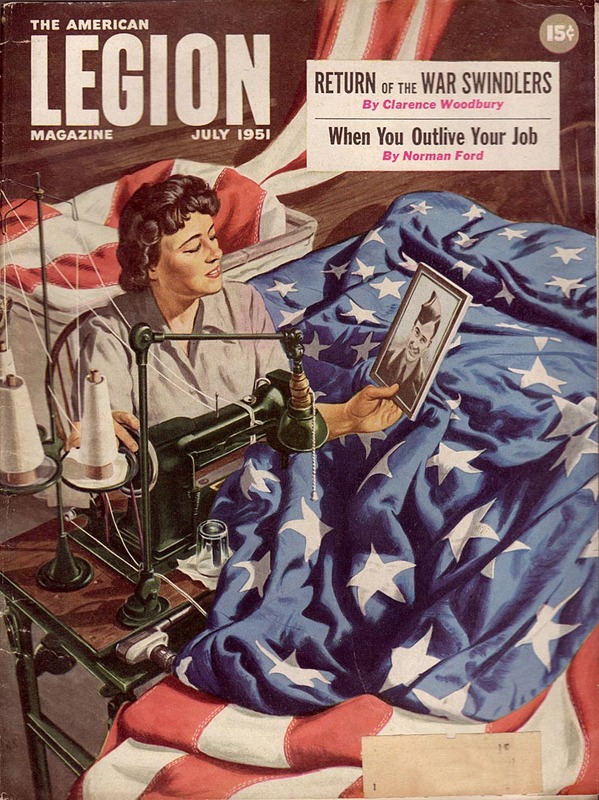 Steve sent quite a few more American Legion covers, which we'll look at on another day. For now, to all our American friends, Happy President's Day! 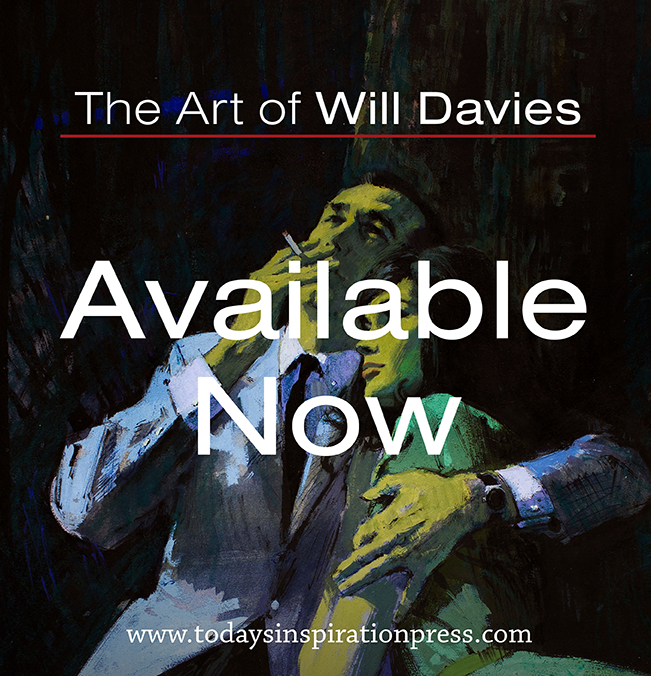 * Visit Steve Scott's blog, which celebrates the work of author John D MacDonald and offers many great examples of mid-century art! Thanks again, Steve! Some of these Reds were propagating dangerous ideas like 'free speech','equal rights for blacks' and 'democracy'. Its just as well we were able to drive them and their like out of society. Saying that, I like these covers.Does that make me a bad person? The irony is, of course, that when the Soviet Union fell and a lot of records came online it turned out that there were, just as Whittiker Chambers wrote in "Witness" a substantial number of avowed Communists actually working in the government of the United States and in the colleges and universities. Not being able to know that or admit it doesn't really make you a bad person, though. Just a colonized mind. If you don't love these covers, you hate freedom. Thank God we had such reasoned voices as senator McCarthy and the KKK to uphold all that was fine and decent. These covers are great. Thanks Leif! The history of the communist party in New York... 13th street it was called... and its relationship to the arts, particularly their interest in taking over all arts groups and making them communist fronts, is fascinating. Seems fashionable for people to dismiss it all out of hand now. I understand that Boardman Robinson and John Sloan were rather early adopters, and tried to steer the Art Students League that way, starting as early as WWI. Often artist who believed in human rights activism felt they had to leave the Communist Party or organizations taken over by them because they were just too radical and crazed with zeal. Ben Shahn's wife was one. An oral history is available on the Smithsonian site. That is fascinating Kev, thanks! :^) I don't know if its fashionable or not to dismiss it out of hand, I think its more an amusement at how melodramatic the reaction was from those who genuinely felt there were 'commies in the woodpile' as the old joke goes. Case in point, my friend Tom Sawyer (back then he was Tom Scheuer) - a Johnstone & Cushing artist and member of both the SI and the NCS - arranged for meetings with a union organizer to present to both groups the benefits of presenting a united front to clients in the hopes of setting some minimum standards for payment and working conditions. In both cases the 'old guard' at both organizations was so incenced that they practically burned the union organizer AND Tom at the stake! I think we can look back on those times with a certain amount of amusement (and cynicism) at what was, at least to some degree, an anti-socialist hysteria that may have had some merit - but was also heavily motivated by those with a vested interest in maintaining the status quo. First... I think these covers are really good. Second... Even considering the fact that the communist world was obviously a true dictatorship, and Stalin had dark interests in USA, macchartism was a harmful time for USA and the rest of democratic countries, as Mr. Mc Carthy was a dangerous, petty and paranoid guy who managed to subjugate an entire country using the fear of communists. This is not speculation, is a fact. A dark page for American Democracy. 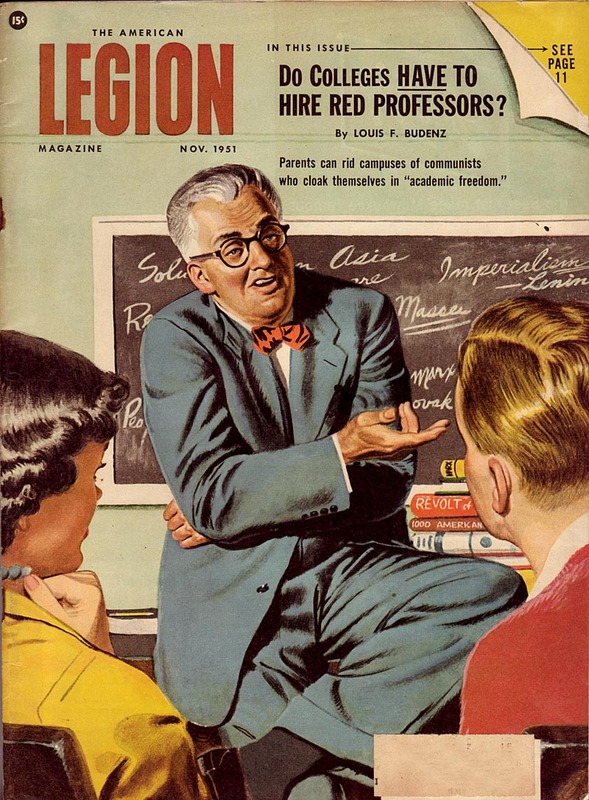 Let's not ignore the fact that the "Red" professor in that illustration looks distinctly Jewish. Not as caricatured as the evil Jules Streicher would publish in Der Sturmer, but it reflects the American version of anti-Semitism. 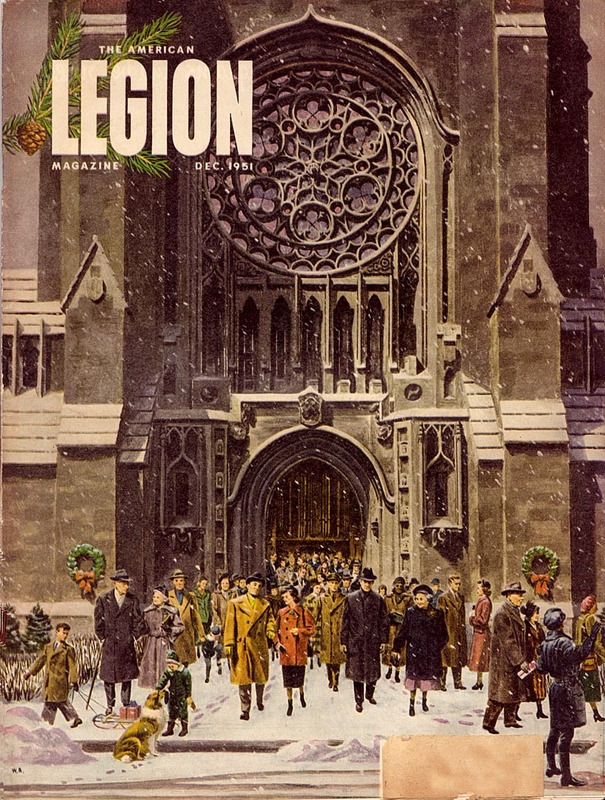 A lot of good people had their lives and careers destroyed in the era of these American Legion magazines. 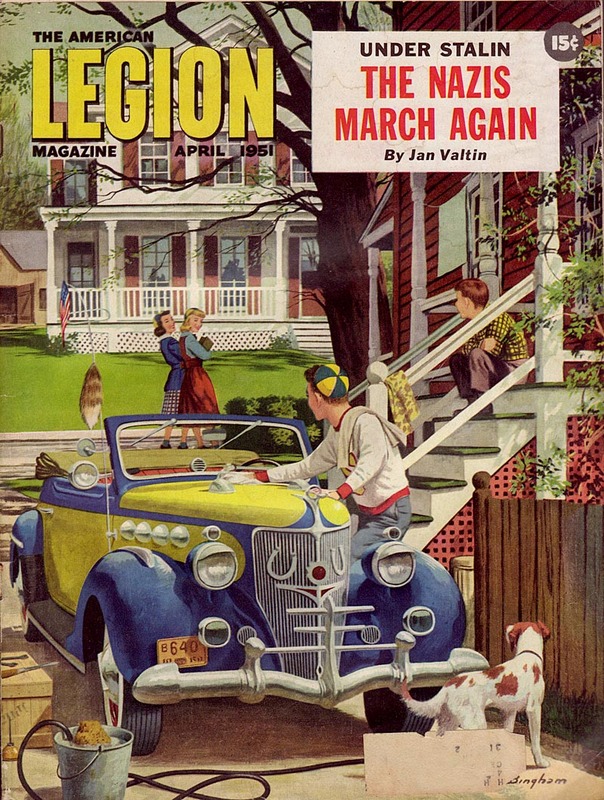 All I can think of now is that poor kid on the second cover and his tiny, tiny car. 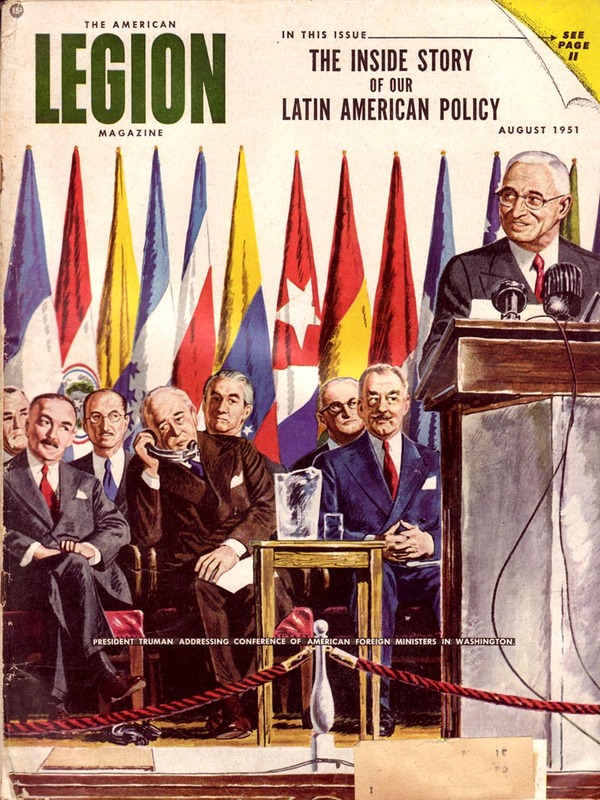 Most countries in Europe had legal Communist parties during this period but didnt need to resort to grisly 'show trials' and red under the bed hysteria.If you believe in democracy you have to deal with opposing points of view in a mature way,and use your secret services to root out the REAL threats, not Hollywood scriptwriters and union activists. I'm in awe at the casual fascism on display here. 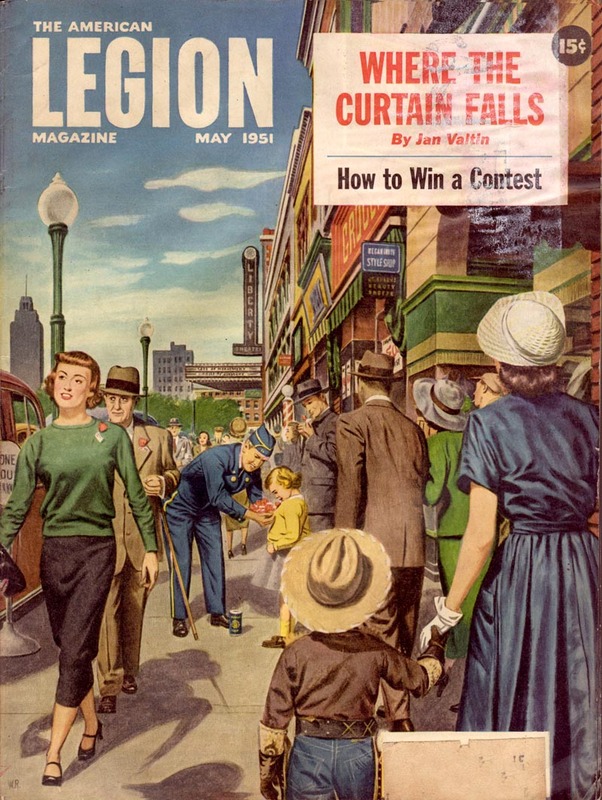 The Legion covers are highly idealized images but unlike a Saturday Evening Post cover or advertising of the era, these covers channel a distinctly political ideology that is equal parts paranoia (because there were reds in America, reds were threatening to take over) and authoritarianism (that homespun commonsense of the wife-beater mindset: it's my way or the highway). 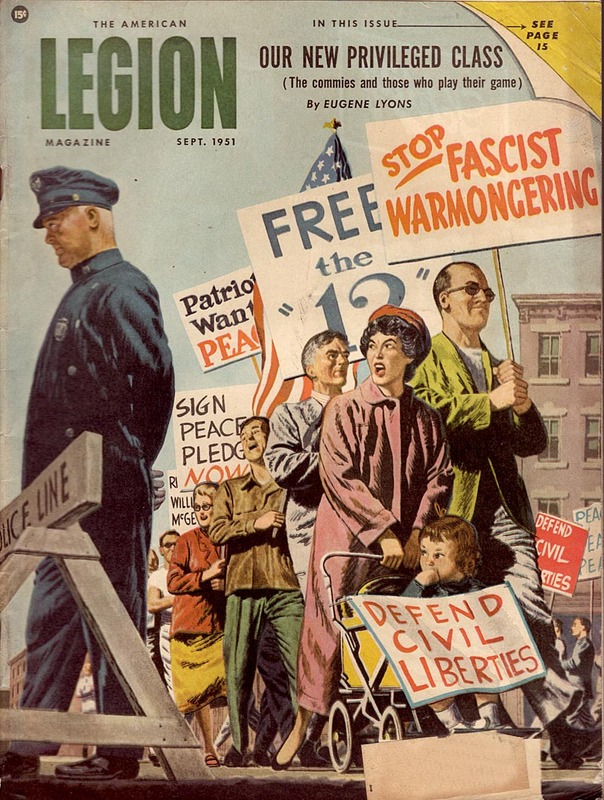 These covers are propaganda and of a particular evil sort insofar that they advance the American idea that obliterating all human life in nuclear war is vital necessity to protect freedom and liberty. Gosh, these covers make genocide look heroic! Anonymous, I just looked back over all these covers and I think you're over reaching. You're reading too much into them. I think these images reflect America more than propogate some symbol/idea of America. Studies show that the Communists managed to kill 100 million people in the 20th century. Communism was a double whammy, no personal freedom and zero prosperity. Unfortunately, we still have apologists for these totalitarian despots even today. Yes, I mean you Alex. You too, Leif Peng. 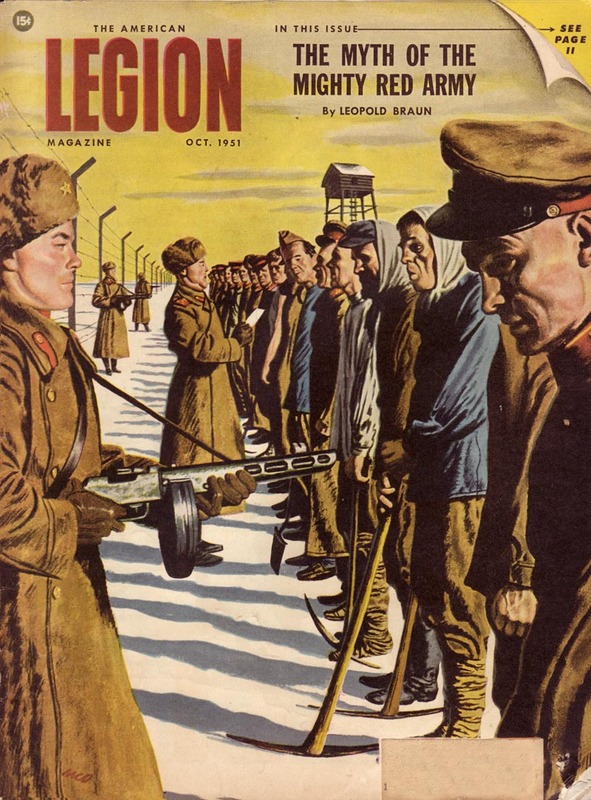 The uncomfortable fact for people like the writer, who makes fun of the anti-Communist magazine covers, is that the covers were right and he is wrong. When the Soviet archives were finally opened up, it turned out that the American government, movie industry, universities and mass media were in fact full of people working for Communism, and many of them weren't just naive and idealistic fellow travelers, but hard-core cases directly controlled by Moscow. McCarthy may have been an imperfect advocate against Communist subversion, but he was, by and large, correct, and he certainly was on the right side.